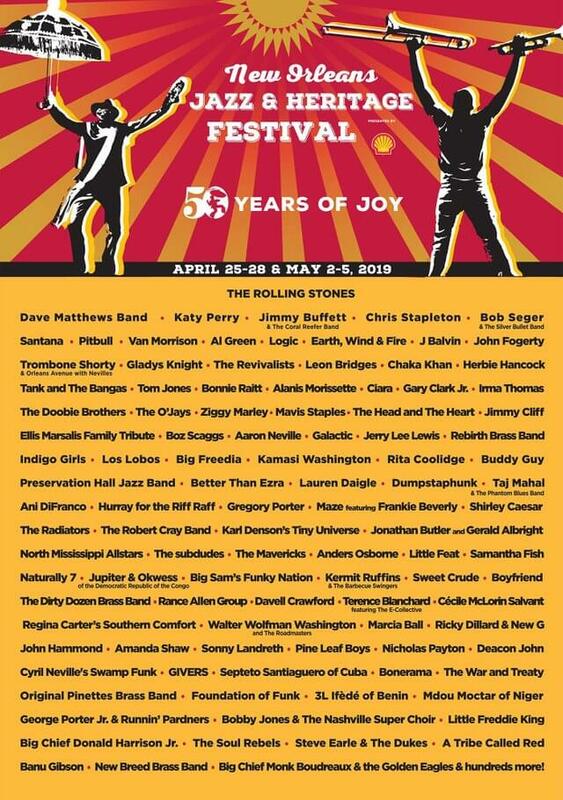 Are you going to the New Orleans Jazz Festival for the first time this year? The NOLA Jazz Festival was an absolute dream of mine, and one I saw come true. Unfortunately the year I went it got cancelled halfway through thanks to the weather BUT that’s not going to happen to you. Hopefully. 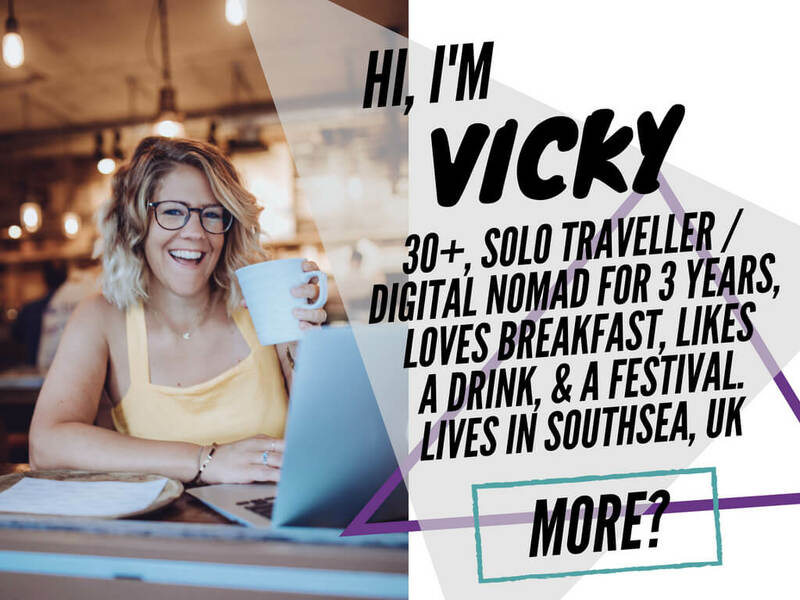 I did manage a few days at the festival though, so I want to impart my tried and tested knowledge to help you have the best festival ever. And this year, in 2019, it’s the 50th festival celebrations – it’s going to be a good one! The year I went to New Orleans Jazz Festival, it was cancelled halfway through day three. One of the saddest things I’ve ever seen at a festival was Stevie Wonder on stage, in a big hoody, with a megaphone, trying to sing to everyone to come back again. Sadly by that point everyone had had enough. He was meant to be headlining that night, and I was SO excited to see him, but being New Orleans the rains the day before hadn’t drained and now the waters were up to our knees at various points. So, not that that’s going to happen to you but, as I say, be prepared for all weathers. It was actually still warm, so my flip flops were a pretty good choice. It meant I could take them off to wade through the waters. Also, I was wearing cotton three quarter length baggy trousers that I could just roll up. When it comes to what to wear for New Orleans Jazz Festival I’d recommend keeping it simple, but take supplies and look at the forecast before you leave the house. Take a hat as it could be hot, take a jumper as it might get cold and don’t take anything you don’t want ruined as it’s kinda dusty. If you’re not American, and used to it, the tax and tip added on to all food and drinks can totally put your budget out. Expect to pay around $6 for a drink, although there’ll be at least another $2 on to account for this. Americans are very particular about their tipping system and there’s no way you can get away without paying. You’ll probably be publicly shamed so I wouldn’t even bother TBH. 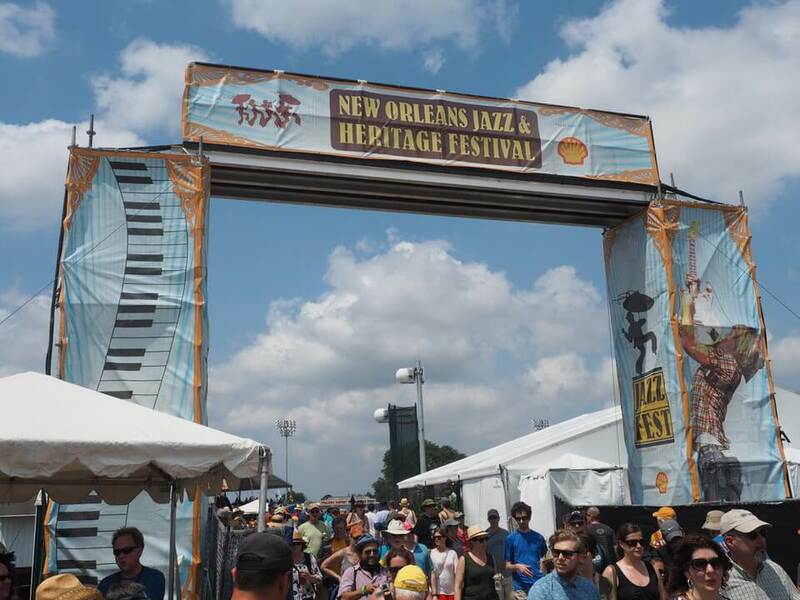 Where is New Orleans Jazz Festival? 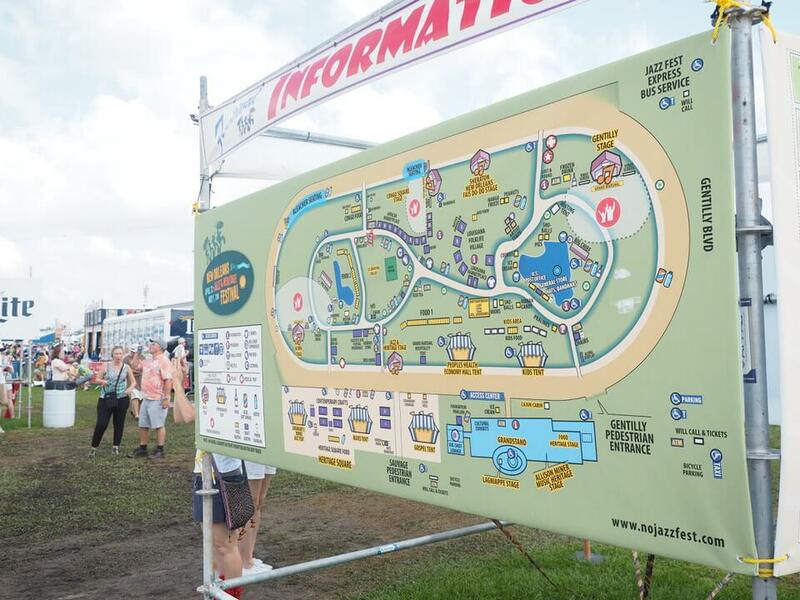 The New Orleans Jazz Festival takes place at the Fair Grounds Race Course, a horse racing track in the middle of New Orleans. 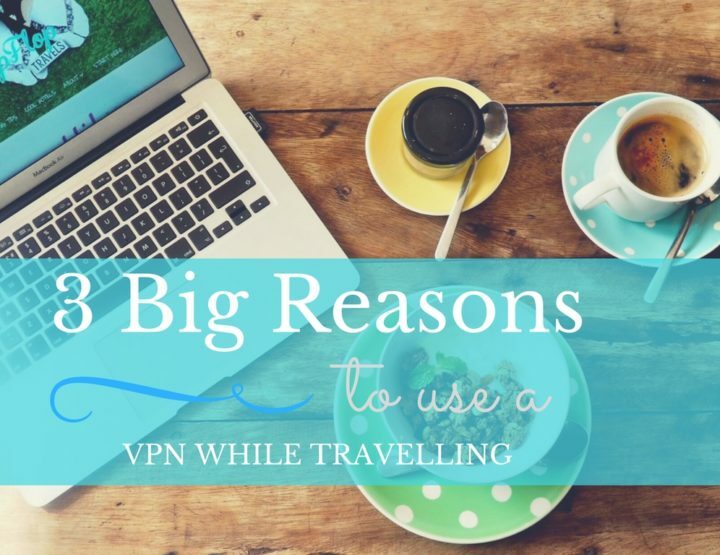 It’s easy to get to by public transport, or you could cycle there. They love a big cocktail in New Orleans. If you go down Bourbon Street it’s what it’s famous for. Personally my body actually can’t take that amount of sugar, like, my face came out in a rash at least three times in New Orleans. Stick to the wine and beer if you’re not a fan, but you gotta have at least one to get in the spirit of things. And as for the food: so much choice. 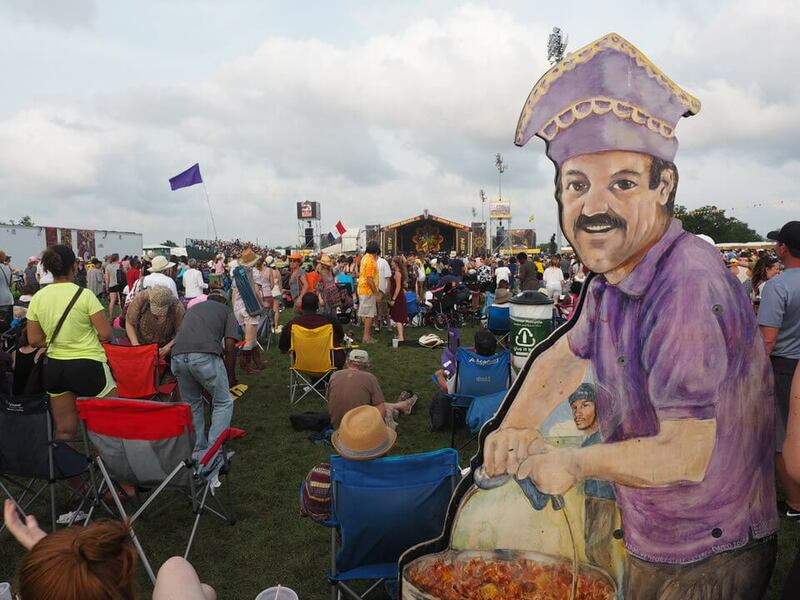 The festival has a policy of ‘no carnival food’ which has led to the food offering at the New Orleans Jazz Festival to be as interesting as the festival itself. 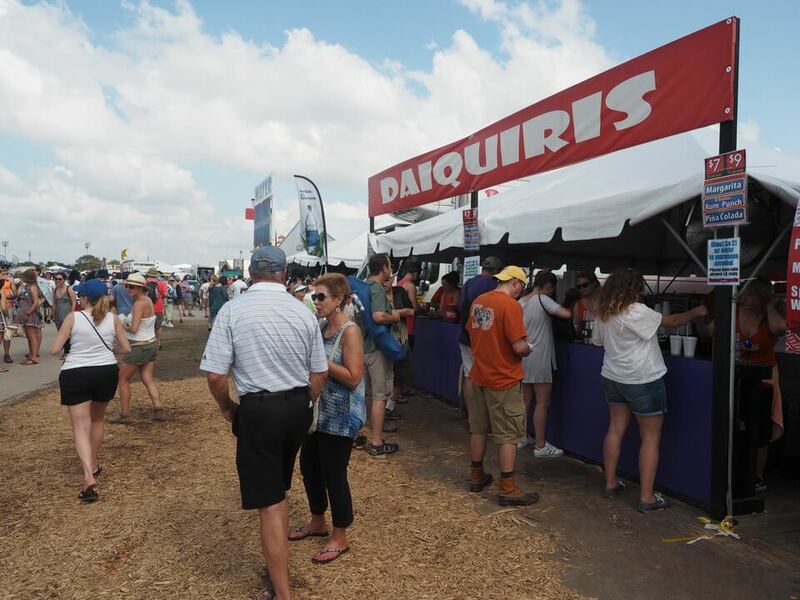 According to the official sources there are more than 70 food booths serving such NOLA delicacies as crawfish beignets, alligator sausage po boys, boiled crawfish, Cajun jambalaya oyster patties, jalepeno bread, muffulettas and red beans and rice. All the food vendors are small, locally owned businesses – which is awesome. After all, the food in New Orleans is one of the main reasons to visit, right? 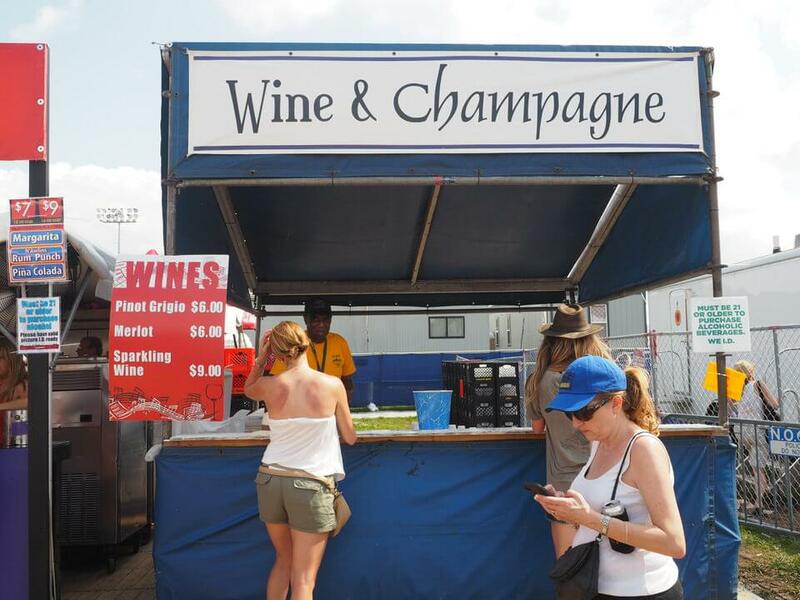 New Orleans Jazz Festival drinks prices: expect to pay upwards from $6. 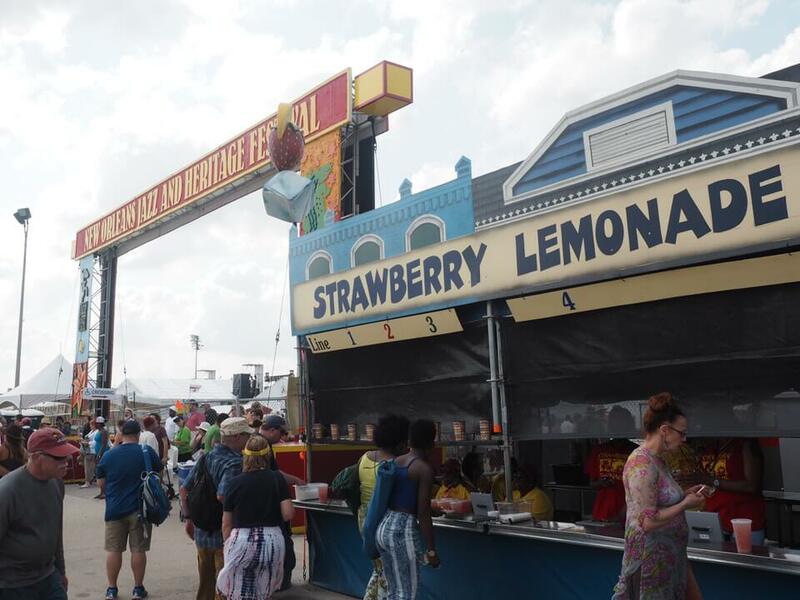 New Orleans Jazz Festival food prices: also, $6 and upwards. The bars around the New Orleans Jazz Festival are very much open for business. There were some lovely little breakfast places if you want to have a good feed before you go in, just outside the grounds. The getting to the festival and queuing up is all part of the experience, so make sure you have a roadie drink to enjoy on the way. New Orleans Jazz Festival tip: You’re not allowed to bring any drink or glass bottles into the main arena. 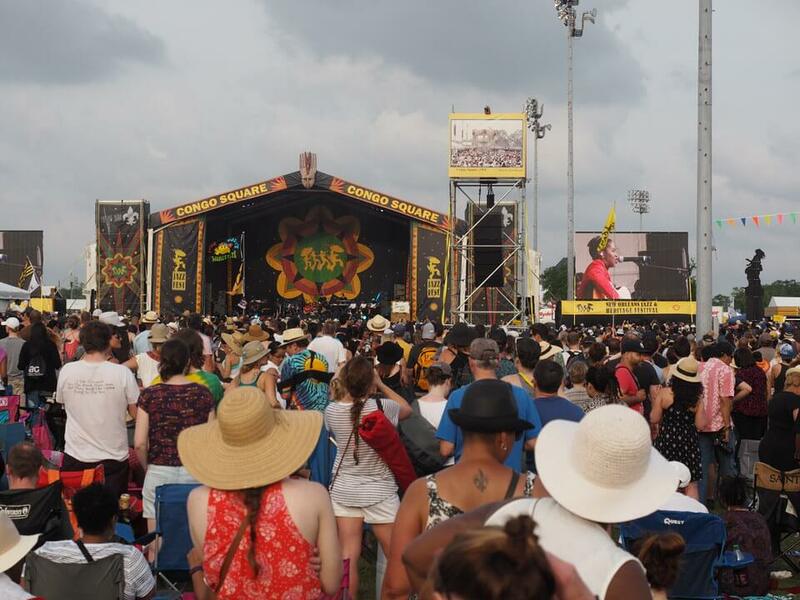 When is New Orleans Jazz Festival? 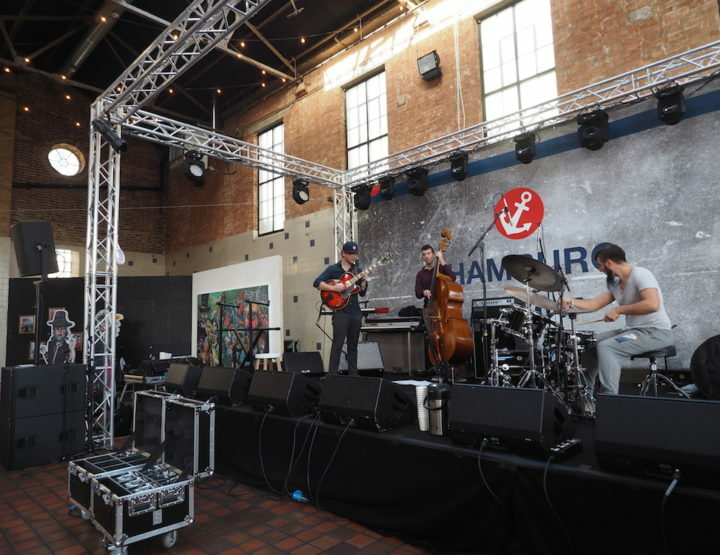 In 2019 the New Orleans Jazz Festival opens on Friday, 26 April and ends on Monday, 6 May. I stayed at a youth hostel in New Orleans, and just got the tram in. I was in New Orleans for three weeks so had a good look at a few of the accommodations there. Check out my comparison of the New Orleans hostels here. It doesn’t really matter where in New Orleans you stay, as getting the public transport at the festival end is the difficult part, and there won’t be any availability up that way, guaranteed. The after parties are all in town anyway. 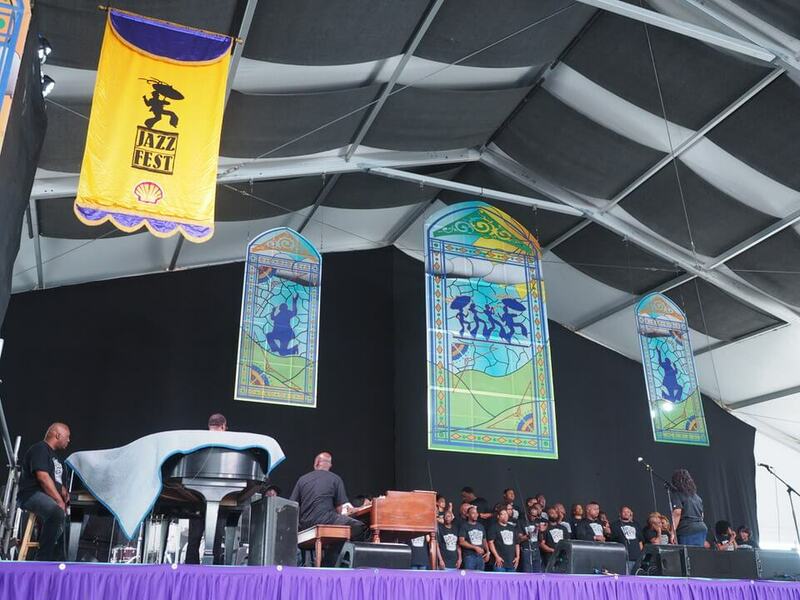 Make sure you have a look around and don’t just focus on the main stage at the New Orleans Jazz Festival. Some of the absolute gems are to be found on the smaller stages. I really enjoyed the gospel stage, and loved the audience participation. Before the festival was called off I’d managed to find shelter in a tent with a brass band playing. The audience were all up and dancing and having a lovely time ignoring the downfall outside. There was a beautiful sense of camaraderie in the tent, sheltered from the rain. 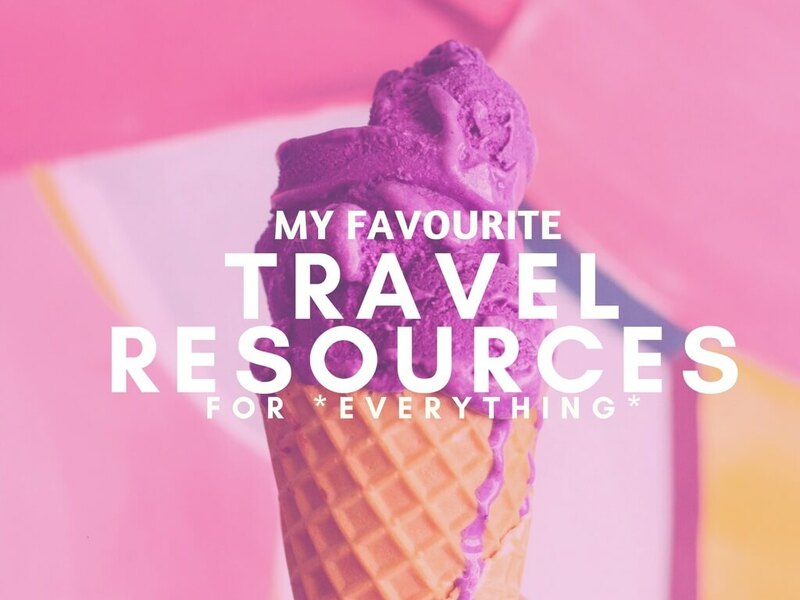 Explore the small stages, go to something you wouldn’t normally, and just have fun with it! Jazz Fest doesn’t sell out, so if you are worried about the weather then just wait until the day and buy then. I did get a refund on my ticket btw, for the day it was cancelled. 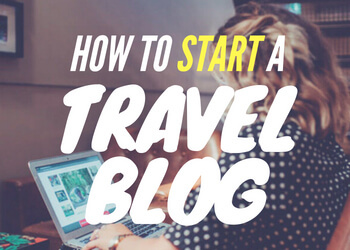 Obviously it’s nice to have your ticket bought and ready, especially if you’re coming from overseas, but this wouldn’t be the ultimate New Orleans Jazz Festival survival guide if I didn’t mention a little hack I wish I’d thought of. I’ve never seen so many people bring chairs to a festival as at the NOLA jazz festival. Seems like people just come for the day to chill out, eat, and watch music, rather than doing any dancing. So, if you want it, bring it. Obviously means you’ll have to carry it all day though, unless you just set it up somewhere and hope it’s there when you come back. Personally I do think this is a bit douchey though. You can buy cheap camping chairs at Walgreens but make sure to donate them before you leave. Alternatively you could bring a blanket although if it’s muddy in any way you’re kinda screwed. Try and get one with a plastic base on it, like this. The festival is super chill so unless you’re going to dance at the front to bands I think you’ll enjoy the comfort of having a seat. The NOLA Jazz Festival finishes pretty early but that definitely doesn’t mean the party is over. The bars around Frenchman Street will be going on until late, but the best ones might have a queue, or need tickets, to get in. 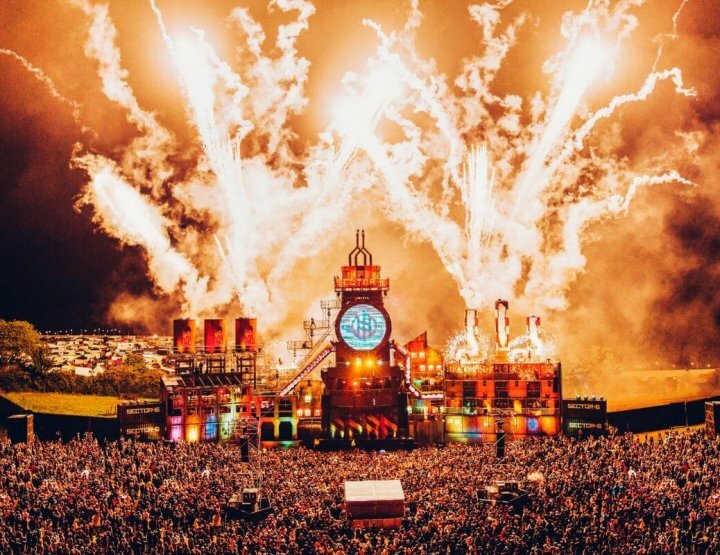 In your pre planning for the festival have a look at the bars and check out signs and websites to find out the best pre and post parties to really get involved. Take a look at JazzFestGrids.com for all the best in the post parties. I didn’t actually use this site when I went but I have it on good authority that it’s the best party planner there is. Don’t rush back into town after the festival is over. There are always street parties and street bands playing as the festival ends, and you could tag onto the back of a street parade if you time it right. Also, if you leave after 6pm, the taxi queue will be insane so you might as well walk, or get public transport. Bikes are always recommended but I couldn’t find one to rent. Top New Orleans Jazz Festival tip: you can take your drink from bar to bar so long as it has a lid on it. This is why there are so many of those kiddy plastic containers with swizzle straws. You can drink all the way to and from the festival if you have one of these. And yes, it’s one of the reasons why people love New Orleans so much. 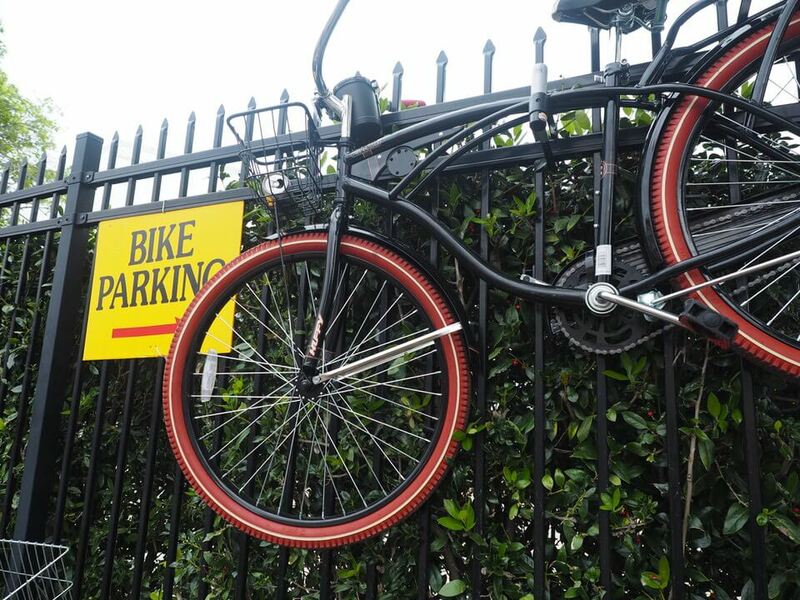 15 Things to Do in New Orleans for $5, or Less! Which Hostel is Best in New Orleans?